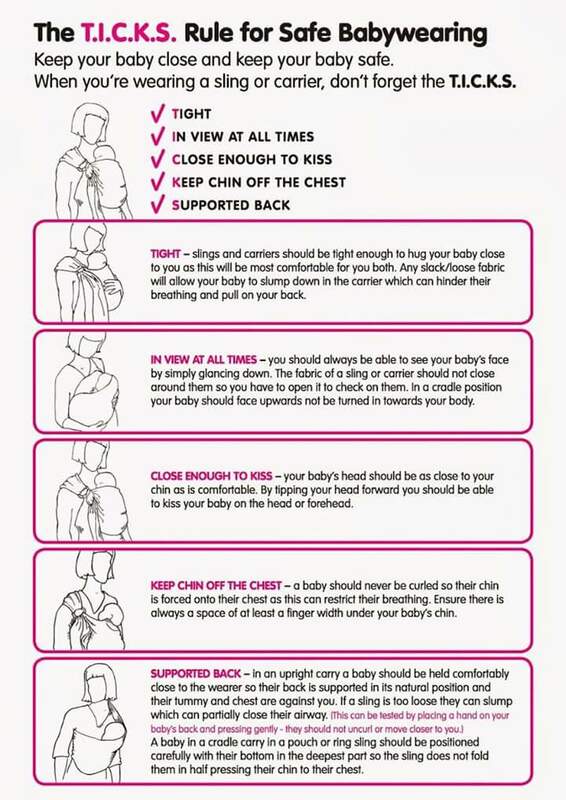 There are a number of different guidelines which have been developed to help highlight the safety aspects of using a carrier or sling. I think probably the best known about in New Zealand would be the “TICKS” which I have previously shared. The An’So guidelines developed by were developed through a project led by French Consultants Inter-School Board and translated into English by Slingababy. More information can be found on the UK Sling Guide page. I particularly appreciate how much more detailed this guideline is than some of the other options (TICKS, HANDS, ABC, KISSES), that it addressing positioning in the carrier and that it covers some of the concerns about safety which are not in the other outlines. When it comes to safety of a newborn, airways and airflow are the most concerning aspects. Ensuring baby keeps their chin off their chest and have clear airways with clear airflow are the most important aspects of safety with newborns (this is what the other three examples really boil down to addressing also). But as your children grow, the aspects of primary concern in terms of carrying safety also change. It is easy to forget or not consider what is within reaching distance of your child while you are wearing a carrier, lots of people I know have got home from a shopping trip with an older baby strapped to their back and taken them off to find stolen produce stuffed between themselves and the child! Categories: babywearing, Babywearing Solutions, Safety & Positioning | Tags: anso, babywearing Safety, safety | Permalink. Categories: Babywearing Solutions | Tags: babywearing, babywearing Safety, ticks | Permalink.